Watch what happens when you share positive feedback with your team. 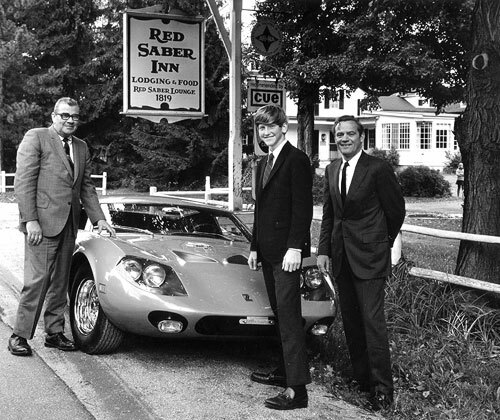 I eagerly entered the foodservice industry in 1967 when my parents purchased a Berkshire mountain inn located in the small town of South Egremont, Massachusetts. I was 13 when I was introduced to the art of dishwashing at our Red Saber Inn. One breakthrough day, I carried a guest’s luggage to their room and earned my first tip of 50 cents. My first gratuity really got my attention and made a lasting impression. My future tips would soon exceed my weekly allowance. The ‘60s were the days of the first Star Trek. Teenagers could watch NASA missions, including the first landing on the moon, in their schools’ all-purpose room every month. 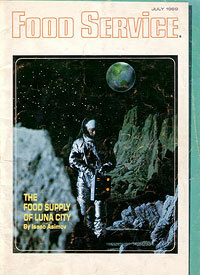 In my father’s July 1969 issue of Food Service Magazine, the cover story by Issac Asimov was titled, “The Food Supply of Luna City,” and it talked about the challenges of placing a colony on the moon. The foodservice industry had to figure out how people were going to eat and drink on the moon. In the same magazine, I spotted a bright orange exotic sports car in a two-page ad for a Pepsi-Cola “Name the System” contest. Pepsi wanted a name for the first true “systems approach” to postmix dispensing of soft drinks they had just created. 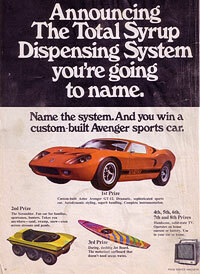 First prize was the custom-built Aztec Avenger GT-12 sports car. There were seven other prizes. Second prize was a new six-wheeled all terrain vehicle and third prize was a motorized surfboard—something every teen living in the mountains needs. Prizes 4–7 were handsome, solid state televisions that could operate on house current or battery. I read and re-read the official rules carefully and noticed there was no minimum age requirement. I began to think about and write down ideas for the name of the system. My father, who had once sold for Canada Dry and was familiar with some industry terms, also gave me a few ideas. I thought of 10 names and mailed separate entries before the end of July deadline and then forgot about the contest. As a member of the “Pepsi Generation,” I had a lot going on in 1969… sports, music, being a teenager along with my sister Joan, and my glorious Colts had star quarterback John Unitas taped up, dressed in blue and white, and playing in Baltimore, Maryland where the Colts belonged! I was at high school football practice when my father arrived and asked the coach if he could speak with me. I have to admit I was a little perturbed being asked to leave the field to talk to a parent in front of the football team. But my father was smiling and informed me I was a finalist in the Pepsi-Cola contest and we would learn the judges’ final decision later that night. I was frozen in place next to our phone when the call came from New York that night. I was told I was the grand prize winner and the Aztec Avenger sports car was mine. My father and I would also be receiving a first class trip to the famous Sands Hotel in Las Vegas for the annual Pepsi-Cola shareholder convention in a few weeks. So, at the age of 15, without a driver’s license and too young to drive, I would soon have a new sports car and national publicity from Pepsi-Cola. A career in foodservice was looking very good to me. And it still does! Foodservice was my first choice for work and as a career. I am extremely satisfied with my career choice and I am honored to serve as an FCSI professional foodservice consultant. If we can just get that Jetson’s space travel thing completed and finally figure out how to live on the moon, we will be growing new markets very soon. And the name that won the Pepsi-Cola “Name the System” contest… Syr-O-Matic. If you want an example of brand loyalty, my wife, Pamela, and I are still drinking Pepsi products today—caffeine free Diet Pepsi.